Yesterday evening the air cleared out here and the breeze picked up, offering a perfect moment for getting out into the woods. Willie was raring to go, so off we went (while our Westie Ruby stayed home to forage for left-over scraps of “whatever” in the chicken coop). Tender new shoots are pushing their way up through last fall’s detritus on the woods’ floor; and what I especially noticed yesterday was the remarkable mix of scents that the breeze carried. I felt like a wine connisseur, sniffing the evening air … in which hints of lilac and apple blossom and new-mown grass from some far away lawn were mixed with underpinnings of leafy mulch … our springtime earth churning with a mixture of decay and new life. It was definitely a “chewy” mix! And what a gift to have Willie trotting happily ahead … after we thought we were going to lose him right around this time last year. 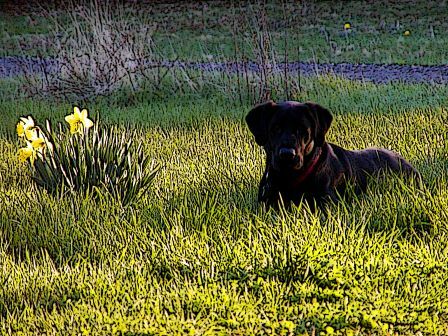 He’s slowed, for sure … but clearly enjoying every moment of this burgeoning spring. Ahhhhhh …. ! PS Congrats, RPE … good job putting soccer players on the map!